MOSCOW, November 27 (RIA Novosti) - All units of Russia's naval infantry will be fully equipped with advanced weaponry by 2015, the Russian Navy said in a statement on Friday. "The naval infantry will receive T-90 tanks, BMP-3 infantry fighting vehicles, BTR-82A armored personnel carriers, BRDM-3 armored reconnaissance vehicles, 120-mm 2C31 Vena self-propelled guns, modernized air defense systems and small arms," the statement said. Russia's naval infantry, which is part of the Navy, consists of three brigades, two independent regiments and two independent battalions totaling about 12,000 personnel. Naval infantry units from Russia's Northern, Baltic and Black Sea Fleets took part in the Caucasus 2009, Zapad 2009 and Ladoga 2009 strategic exercises, while naval infantry from the Pacific Fleet regularly participates in Russia's anti-piracy missions in the Gulf of Aden. Hope those BMP-3 are BMP-3M's, cause anything other is not really a step forward. If the Navy is going to start using the T-90, then why not acquire the BMPT? I mean, it would be better in the infantry fighting enviornment, and it has the capabilities of taking out tanks. I would prefer that over BMP-3. sepheronx wrote: If the Navy is going to start using the T-90, then why not acquire the BMPT? I mean, it would be better in the infantry fighting enviornment, and it has the capabilities of taking out tanks. I would prefer that over BMP-3. The BMPT is a fire support vehicle that accompanies tanks in urban environments. The BMP-3 is for transporting troops. Do you mean the BTR-T? Russian forces have freed the crew of a Russian oil tanker seized by Somali pirates off the coast of Yemen, in a dramatic rescue operation. 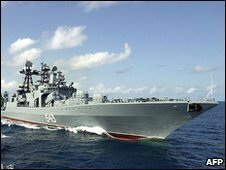 Forces on the Russian warship Marshal Shaposhnikov approached the tanker with 23 Russian crew on board by helicopter. As they did so, the pirates opened fire, sparking a shoot-out. The Russian forces then abseiled onto the Moscow University tanker, freeing the crew who had locked themselves in a safe room after disabling their ship. Ten pirates have been arrested, says the BBC's Richard Galpin in Moscow. They are currently being held aboard the tanker, Russian defence ministry spokesman Col Alexei Kuznetsov said. They will be transferred to Moscow to face charges, reports say. There have been unconfirmed reports that one pirate was killed during the siege. "Pirates have released the tanker... All crew on board the tanker are alive and well," a spokeswoman for the Russian shipping company that owns the tanker, Novoship, told Reuters news agency. "During more than 20 hours of siege, pirates were not able to take a single member of crew hostage." Novoship praised the operation as one carried out "in the best traditions of the Russian naval mariners". The decision to free the ship was made knowing "that the crew was under safe cover inaccessible to the pirates and that the lives and health of the sailors was not threatened by anything", Novoship added. Although there are dozens of warships patrolling the Indian Ocean and the Gulf of Aden, it is rare for rescue efforts to be launched once pirates have boarded a vessel as it is often felt that intervening would endanger the hostages, says the BBC's Will Ross in Nairobi. But in this case, the crew switched off the engine and locked themselves in a strong room with a reinforced door. This tactic of retreating to a strong room has thwarted two previous hijacking attempts on other vessels, our correspondent adds. The Moscow University was seized on Wednesday in the Gulf of Aden, off the coast of Yemen, as it sailed for China, carrying more than 80,000 tonnes of crude oil worth some $50m (£33m). The Gulf of Aden is one of the world busiest shipping routes, and the Russians, Europeans and Americans have all deployed navy forces in the region after a growing number of attacks by pirates on commercial vessels, our correspondent adds. Even so, pirates are reported to be holding more than 20 foreign ships with almost 400 sailors. The Marshal Shaposhnikov was sent on Wednesday to rescue the hijacked tanker. Three cheers for Russian Marines! Hip hip hooray for the Marines and for the crew who did everything right! Have read from several sources about this event, the safe room according to some was the engine room and the walls were 25mm thick. With that sort of thickness a rifle calibre weapon or an RPG would be no good to get into such a room. The rifles will not penetrate that much armour and the RPG will have problems because if the rocket hits the door before it has armed you will have a dud rocket to deal with. Even if it did hit cleanly it would only burn a small hole and would be very tricky to fire at the door without injuring or killing those that fired the rocket. A trained person with plastic explosive would get in but these guys are not trained. Apparently the save room had food and water and a radio stored inside it and because it may have been the engine room they could shut down the engines so the hijackers couldn't control the ship. Congrats to the crew for being prepared, and the forces that rescued them so professionally. GarryB wrote: Have read from several sources about this event, the safe room according to some was the engine room and the walls were 25mm thick. With that sort of thickness a rifle calibre weapon or an RPG would be no good to get into such a room. The rifles will not penetrate that much armour and the RPG will have problems because if the rocket hits the door before it has armed you will have a dud rocket to deal with. Even if it did hit cleanly it would only burn a small hole and would be very tricky to fire at the door without injuring or killing those that fired the rocket. My understanding is that the ship was loaded with petroleum and that the Somalis were afraid of triggering an explosion. Dunno if that is true or not. Actually that is one of the draw backs of the safe room idea, that the pirates might get frustrated and do something stupid like set fire to the cargo or try to sink the ship. Anyway, congrats again to the Russian Navy for their professional response. It is good that Russia is participating in dealing with the pirating threat. Actually this is a bit off topic but about 10 years ago or so I bought a computer game called Ka-50 Hokum that is set in the south china seas where you control a ship that you can navigate around the south china seas looking for pirates. The ship has an anti aircraft gun that you can use to shoot down any threats to the ship, but your main goal is to fly one of 4 helicopters you have on board on missions to defeat pirates by attacking their bases. It is basically a flight simulator based on a transport ship with 4 different helos to fly. They are the Ka-50 Hokum of course, the AH-1 Cobra, the Mi-8 Hip, and the British Lynx. It was made in 1994 and the graphics are a bit primative, but a modern version would be great. You could have a range of ship types like dedicated helicopter carriers like Mistral, or vessels that look like cargo ships with more basic self defence equipment. You could fly a range of helos and also probably widely expand the number of different areas you could be assigned to defend to include Yemen. It was made in 1994 and the graphics are dated, but I enjoyed it. Thanks for this pointer and if you have any more, let me know. Russian defense ministry ordered a new tracked combat vehicle to be designed specially for the Navy but not refitted from army hardware. According to Izvestiya, new self-propelled vehicle will be capable to move both on land and at sea staying afloat even in strong sea disturbance. The new naval combat vehicle will be designed by JSC Kurganmashzavod. New vehicle will be based on multipurpose tracked carrier which will be also used in other types of combat vehicles for the Army, Airborne Troops, and air defense mounts. Naval version will be equipped with engine-driven screw making possible to sail at speed up to 25-30 kph. By initial estimates, naval tracked combat vehicle will be fielded in 2015-2016. The military expect new vehicle to widen the range of tasks. In particular, landing troops will reach coast in half an hour during over-the-horizon discharge. Currently used BMP-1 and BMP-2 are non-effective in sea disturbance, so are not frequently used in landing drills. At present, landing troops are mostly delivered by navy-adapted BTR-80 armored personnel carriers, landing ships or boats. According to a source, defense ministry does not order the latter ones focusing on procurement of French Mistral-class assault landing docks capable to put afloat troops beyond the horizon. It was reported late in 2009 that all marine units would be completely rearmed by 2015. Procurement of new hardware will be carried out under State Arms Program 2011-2020. 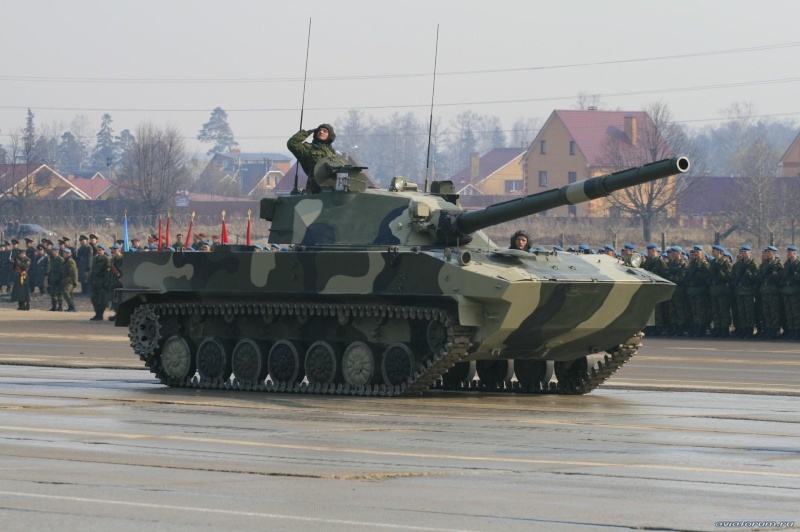 The document provides deliveries of main battle tanks T-90, infantry combat vehicles BMP-3, armored personnel carriers BTR-82A, combat reconnaissance landing vehicles BRDM-3, 120-mm self-propelled guns 2S31 Vena, modernized small arms, grenade launchers, and antiaircraft assets. The new small arms might be the ADS underwater assault rifles. I recently read a news article where the Russian Navy rejected buying new Zubr air cushion landing craft. They said they were looking at the new landing vessels that come with the Mistrals as a basis for new landing "craft" for the future. new tracked combat vehicle to be designed specially for the Navy but not refitted from army hardware. Seem to contradict each other. The Army is designing and building multipurpose tracked and wheeled platforms for use as tanks, and APCs and IFVs, and Artillery vehicles, and Air Defence. The new naval combat vehicle will be designed by JSC Kurganmashzavod. UVZ is making the Armata multipurpose chassis for the heavy brigades of the Army, while JSC Kurganmashzavod is making the Boomerang, Kurganets-25, and Typhoon vehicles for the medium, medium and light brigades respectively. Clearly they are making a customised version of the tracked 25 ton amphibious Kurganets-25 with propellers and fully customised for use in rough sea states for the Navy. In the medium brigades the Kurganets-25 will have tank, BMP, BTR, ZSU, and likely a 120mm mortar vehicle in addition to command and anti tank missile (Kornet EM) vehicles. I would suspect the Navy will want similar vehicles too... which means all the vehicles could land on the beach together and operate completely together... ie no landing infantry but having to wait till the beach area is secured to bring in the heavy vehicles like tanks. The Russian Naval Infantry have been gradually phasing out PT-76 amphibious tanks, but have not yet received a large number of T-80s. A full-strength Naval Infantry Brigade may have up to 70-80 Tanks. The APCs used by the Naval Infantry are either BTR-80s (in Assault Landing Battalions) or MT-LBs (in Naval Infantry Battalions). While Naval Infantry units were supposed to receive BMP-3 IFVs, few have been delivered, and it is far from certain such re-arming will take place. BMP-3s may equip one company per battalion. The news article you posted stated the Naval Infantry will be fully reequipped by 2015. I would suspect they have had T-80s because the salty environment will be hard on vehicles and will "finish off" the tanks quicker than using them in other units. I would suspect that by 2015 their new amphibious vehicle will be ready... it will be based on the Kurganets-25 and will be a tracked 25 ton vehicle. The Kurganets-25 is a family of vehicles, so there will be tank like vehicles (like a heavy 2S25 Sprut... though at 25 tons the new vehicle will be 7 tons heavier than Sprut), there will be troop transports (BMP and BTR like versions), there will be artillery versions (perhaps with 120mm mortars), and air defence versions (with Pantsir-S1 (ie gun and missile) and likely a new 10km range laser guided SAM system versions) etc etc. All the vehicles in a medium brigade (Tank or Motor rifle) will either be Kurganets-25s or Boomerangs (Boomerangs will be wheeled 25 ton class amphibious vehicles). In many ways the Kurganets-25 and therefore also the Navy standard vehicle are replacements for BMPs, while the Boomerangs are replacements for the BTRs... BMPs are heavier and better armoured with better firepower with tracks for better cross country performance but a slightly smaller squad. The BTRs are wheeled and more mobile on roads with modest armament and lighter armour. The difference is that both the Kurganets-25 and the Boomerang will both be 25 ton vehicles with much better armour, though the tracked vehicle might have generally heavier armament there will likely be tracked and wheeled vehicle Medium brigades. Assault Landing Battalions: Kurganets-25 with BMP-3M-like armament. Naval Infantry Battalions: Kurganets-25 with BTR-82-like armament. TSAMTO, January 24. Fire and maneuver capabilities of artillery Navy substantially increased due to receipt of the army in 2010, more than 20 units. self-propelled anti-tank guns (TEPS), "Octopus-SD." As reported by the Office of the Press and Information Ministry of Defense of Russia, in 2011 the supply of this technology for airborne is not implemented, but already this year, Marines are planning to get about 10 units. 125-mm TEPS "Octopus-CD, which will end in 2012 staffed by new airborne artillery self-propelled guns of up to one third of the existing demand. Light tracked amphibious aviadesantiruemaya antitank gun "Octopus-SD" is designed for combat tanks, self-propelled artillery, armored personnel carriers and other mobile armored targets, fire support units paratroopers. In addition, at the present time, all systems in service with Navy guns, are in-depth modernization, in particular the continued improvement of performance characteristics of the main artillery Airborne - "Nona." As the commander of the Navy, Lieutenant-General Vladimir Shamanov in a recent interview, "at the expense of modernization of armaments could significantly increase the firepower and maneuverability of the artillery assault." Yes, Sprut-SD for Naval infantry. Will VDV also receive more Sprut-SD or they will be now produced only for naval infantry? Is there any plan to install new FCS with Catherine TI like in T-90 or new modernized T-72BM? This is interesting because the Naval Infantry have also said that they want a modified version of the new tracked Kurganets-25, 25 ton vehicle being developed for the medium brigades. The K25 is basically the equivalent of the BMP-3, though at 25 tons it is about 7 tons heavier. The standard K-25s will have BMP level amphibious performance which will allow them to drive straight into rivers and travel across lakes without problem, but the Navy wanted better amphibious performance so they are getting modified designs that allowed them to handle being released into water up to 100km from shore and then sail to the shore and operate as an IFV. The question is, is this order of Sprut a stopgap thing, or do they intend to operate it with the other vehicles. This is important because the VDV might have the same choice. Each of the new vehicle families will have a tank like vehicle so there will be light and medium "tanks". Personally I think that this purchase is a temporary thing and when their new K-25 based vehicle is ready they will operate a light tank version with unified systems and electronics with the Armata Tank. I used to have a photo of a SPRUT-SD landing from a ROPUCHA landing ship. The phot is something like 2 years old. Ca't find it now unfortunately. What are the Marines needs for tanks? in numbers? I think it is a handsome looking vehicle... sure the armour is a little thin, but special forces used jeeps and range rovers with much less protection in WWII, and modern units use all sorts of beach buggy designs that offer no protection to their crews and with nothing like the long range firepower of the Sprut... which can fire pretty much any 125mm gun ammo a T-90 can. When landing on beaches, tanks give naval infantry some punch and power as the make that awkward transition from a sea based force to a land based one. Normally the transition is tremendously vulnerable if there are no tanks... as shown at D Day, with the effort to provide the troops with tanks using skirts to make them amphibious... many of which were tragically lost because of enemy fire and sea conditions and the inevitable being dropped off on a sand bar instead of the beach meaning they had to go back into deep water to get to the beach... for a proper amphibious vehicle that would be no problem and the further out a vehicle can get into the water the safer the ships deploying the forces are. In terms of a MBT gun on a light vehicle, Sprut is perfect, and IMO much better than all other alternatives, especially wheeled. Great to see the design not abandoned after a pitifull production rate.